May 2 Update: The National Weather Service has designated the massive Tuscaloosa tornado as a strong EF-4 storm with winds up to 190 mph. The storm caused over 1000 injuries and at least 65 deaths. 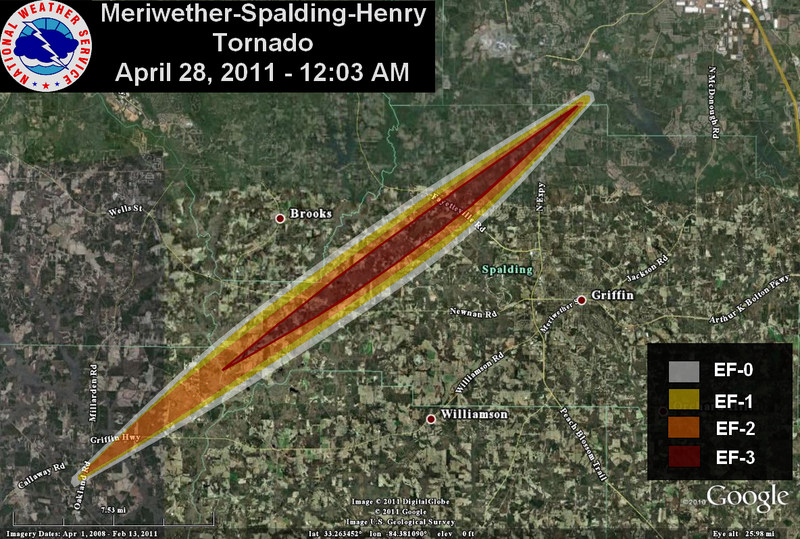 The path length was a very impressive 80.3 miles, and the damage width was 1.5 miles where it crossed highway I-65. The city of Tuscaloosa still reports 340 missing from the storm. 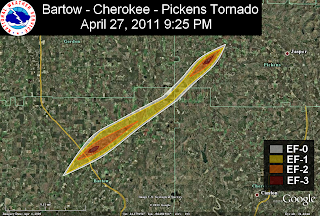 This storm was one of several strong to violent tornadoes produced by a supercell thunderstorm which began in Newton County, Mississippi at 2:54 pm and dissipated in Macon County, North Carolina around 10:18 pm CDT, covering a total distance of 380 miles in a little under 7.5 hours. May 1 Update: The total number of tornadoes for the April 26-28 event has been revised upward to 312, which is now more than double the previous single-event record. 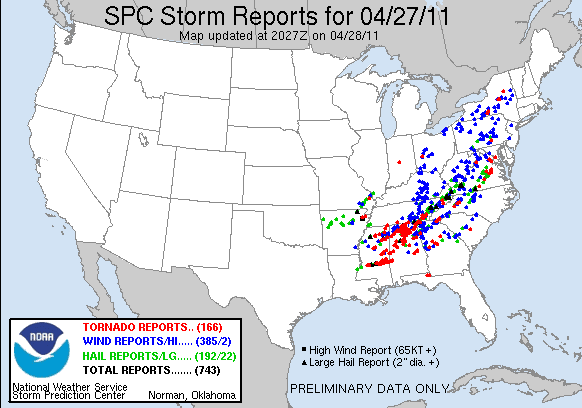 There were an estimated 266 tornadoes in the 24-hour period ending 8 am April 28, which is also a new single-day record. 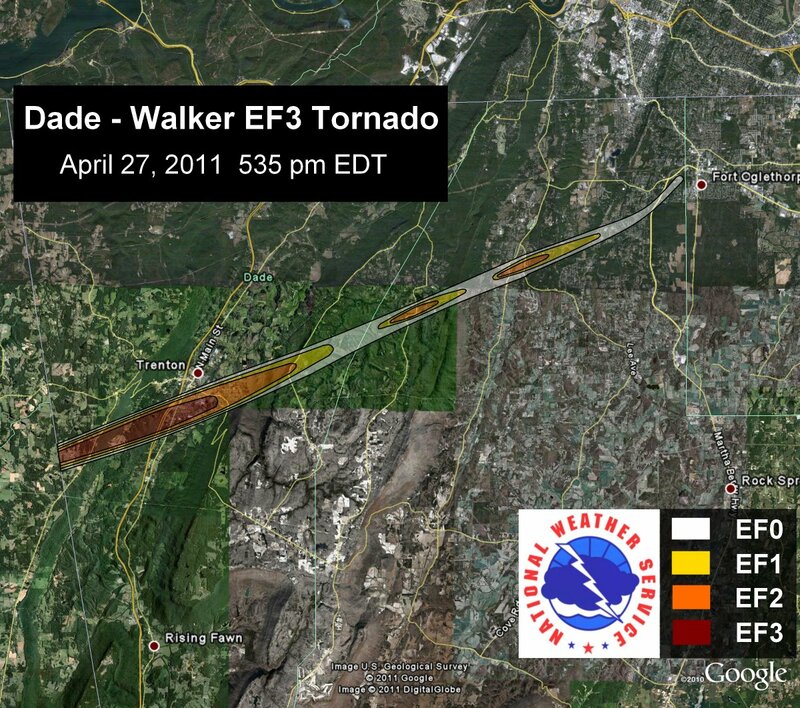 The Hackleburg, Alabama tornado, previously designated EF-3+, has been confirmed as EF-5, the maximum tornado intensity. Winds were estimated at over 200 mph. The path length was over 25 miles in Marion County, continuing into the Tennessee Valley, with a damage width of 3/4 mile. There were at least 25 deaths from the storm. Several subdivisions, the Hackleburg High School and Wrangler Jeans plant were destroyed. A total of at least 100 structures were destroyed. Motor vehicles were moved 150-200 yards. 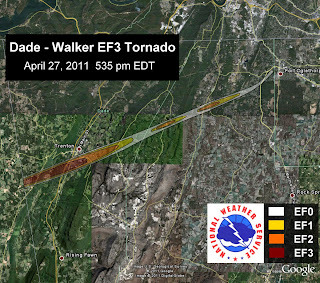 A report from the adjoining area serviced by the Huntsville, Alabama NWS office indicates that this tornado continued as an EF-4 into Franklin and Lawrence Counties with a path length of at least 39 miles and 41 fatalities. "Continuous significant devastation" was reported throughout the city of Phil Campbell, including a church completely destroyed with only the slab remaining. Significant devastation also occurred in the areas of Mt. Hope, Langtown, and extreme northwestern Morgan County. The National Weather Service preliminary count of 288 tornadoes during the event from 8:00 am EDT April 26 to 8:00 am April 28 was nearly double the previous record event of 148 tornadoes on April 3-4, 1974. 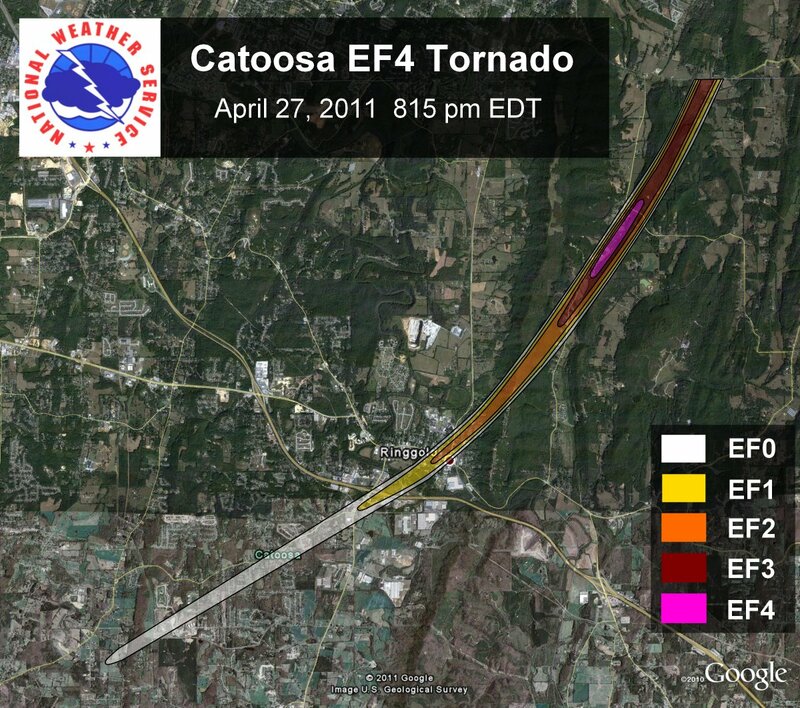 The death toll of 344 is the largest for any tornado event in the modern warning era of radar and satellite imaging. It is the highest number killed in a 2-day period since the 454 deaths on April 5-6, 1936. The 334 fatalities in a 24-hour period are the most in a single day since the 747 on March 18, 1925, which includes the infamous Tri-State Tornado. The death count of at least 65 from the Tuscaloosa-Birmingham tornado is the highest in a single storm since 80 people died on May 25, 1955 in Kansas. The preliminary count of over 600 tornadoes this month is more than double the previous April record of 267 in 1974. 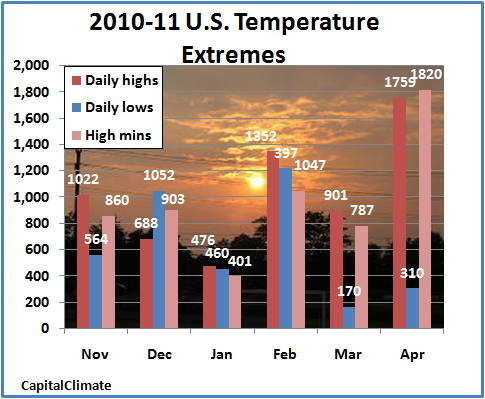 This also beats the previous all-time monthly record of 542 in May 2003. 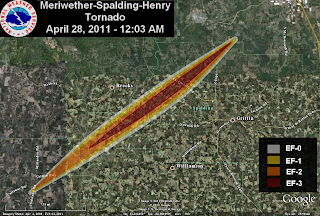 Images (click to enlarge): Preliminary and confirmed storm tracks in Alabama and Georgia from the tornado outbreak of April 27-28, 2011. 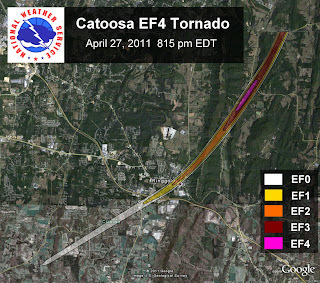 May 1 Update: A second tornado, in Alabama, has now been rated EF-5. April 30 Update: See here for an update on the tornado records being broken. The National Weather Service announced today that at least one of the tornadoes in the major outbreak of April 27 was given a preliminary rating of EF-5, the first one at the maximum intensity in nearly half a century in Mississippi. Damage assessment of the Tuscaloosa, Alabama storm is still ongoing. CANDLESTICK PARK TORNADO NEAR JACKSON ON MARCH 3RD 1966. The overall death toll has now been reported as 272 across 6 states. OK, let's get the caveat out of the way right up front: No individual temperature ever caused a specific storm. When a pattern persists over a large area for an extended period of time, however, it's worthy of notice. The latest reports indicate hundreds of people killed, 162 in the state of Alabama alone, from the tornado outbreak which pounded the Southeast yesterday (April 27). The National Weather Service's Storm Prediction Center has a preliminary count of 164 tornado reports for the day and 3 additional reports so far today. This is the culmination of a month which has undoubtedly broken the April tornado record with 453 separate storms tallied by The Weather Channel. This total, which apparently does not yet include the widespread outbreak of April 27, smashes the previous record of 267 in 1974 and approaches the all-time monthly record of 543 set in May, 2003. Temperature is only one factor in the development of severe storms, but heat provides the energy which makes thunderstorms and their associated tornadoes possible. So far this month, NOAA's National Climatic Data Center reports 1759 record high temperatures in the U.S. vs. 310 record lows, a ratio of nearly 5.7 to 1, exceeding even March's 5.3 to 1. This is the highest since the ratio of 6.1 last April. 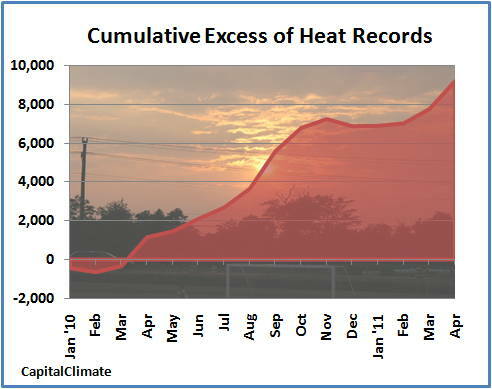 There have now been 13 out of the last 14 months with more heat records than cold records. The cumulative ratio since January 2010 is 2.2 to 1. As shown on the map to the right, April temperatures to date have been above the long-term average across much of the U.S., particularly over the southern portion of the country. Monthly total number of daily high temperature, low temperature, and high minimum temperature records set in the U.S. for November 2010 through April 2011, data from NOAA National Climatic Data Center, background image © Kevin Ambrose (www.weatherbook.com). Includes historical daily observations archived in NCDC's Cooperative Summary of the Day data set and preliminary reports from Cooperative Observers and First Order National Weather Service stations. All stations have a Period of Record of at least 30 years. 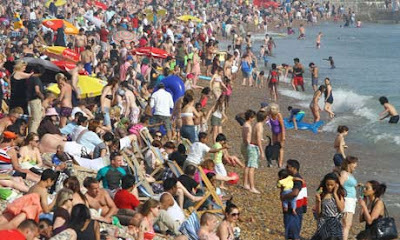 The hottest Easter in at least a century in Britain is keeping this month's temperatures on a pace to break the 2007 record for the warmest April in history. The highest temperature over the weekend was 27.8°C on Saturday at Wisley, in Surrey. In London, the temperature was 27.1°C on Saturday and around 25°C on Sunday, vs. a normal high of 15°C at this time of year. Over 100,000 people were estimated to have flocked to southern beaches this weekend. London temperatures this week are forecast to range from a high of 22°C on Monday to a more seasonable 13°C for the Royal Wedding on Friday. Temperatures in April to date have been well above average over most of Europe, with the highest departures in Spain, France, and Germany. Many of the large windows in the main terminal building were blown out or damaged by flying debris and a large section of roof was peeled from Concourse C. Although the vast majority of people were evacuated to lower levels and to interior rooms before the tornado hit, 5 people were treated and released from area hospitals for injuries due to flying debris. 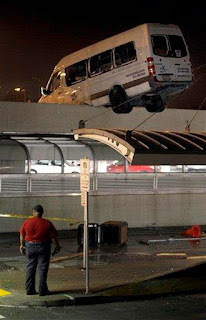 The airport was closed due to the extensive damage. Some flights had resumed by Sunday, with full operations expected by midweek. The lack of deaths from the storm was attributed to the advance warning of at least half an hour and excellent response by the public. 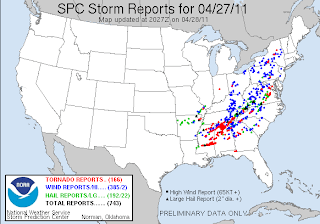 This was the second major tornado outbreak in a metropolitan area in less than a week, following the Raleigh tornado last Saturday, April 16. The Weather Channel reports that there have been 28 tornadoes in St. Louis County since 1950, but there have now been 2 of them since New Year's Eve, both EF-3 or higher.